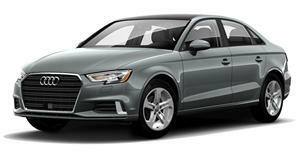 Audi tuner one of the first to offer an aftermarket package for the new A3 Sportback. Audi tuning specialist ABT Sportsline has followed up its A3 hatchback project with a comprehensive program for the five-door Sportback variant. Both the 1.4-liter TFSi and 2.0-liter TDI engines have received upgrades. The smaller unit is boosted from 122hp and 148lb-ft of torque to 160hp and 184lb-ft, while the turbodiesel unit is upped from 150hp and 236lb-ft to 170hp and 266 lb-ft. And as befits a comprehensive tuning job, more power is matched by more aggressive styling. ABT devised a sportier bodykit made up of a front grille, fender inserts, front spoiler, side skirts, a rear skirt insert, rear spoiler and a pair of stainless-steel twin-exhaust pipes. A set of the company&apos;s 18- or 19-inch DR alloys come in gun-metal (pictured), silver or titanium, which enhance the new lowered stance courtesy of ABT suspension springs that takes the A3 Sportback 25mm closer to the ground. The ABT brake system, with 345mm discs and steel-flex brake lines, massively improves the car&apos;s stopping potential. Completing the package is an exclusive bespoke interior designed to customer&apos;s specific needs.